Bagan, with its wondrous vista of pagodas and stupas, many dating to the 12th century, is this region's star attraction. 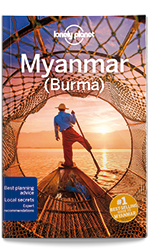 In central Myanmar, ox carts amble through rice fields and rolling plains, rimmed by the Shan Mountains and the snaking Ayeyarwady River. Coverage includes: Yangon–Mandalay Highway, Taungoo (Toungoo), Nay Pyi Taw, Meiktila, Yangon–Bagan Highway, Pyay, Thayekhittaya (Sri Ksetra), Magwe, Bagan & Around, Nyaung U, Old Bagan, Myinkaba, New Bagan (Bagan Myothit), Mt Popa, Salay, Pa-kokku, Monywa & Around.